Conky Colors Gets A New "Board Mode"
Conky is a light-weight system monitor that displays the info on your desktop - you've seen it in many screenshots so I'm sure most of you already know what Conky is. 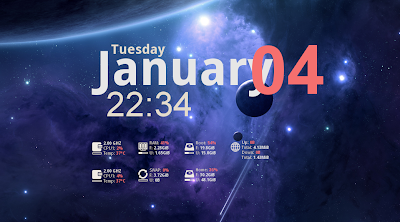 Conky Colors is a tool that make is very easy to set up and configure Conky. To use the new Conky Colors board mode, firstly you'll have to set up Conky and Conky Colors as explained in THIS post. Unfortunately there are two drawbacks to this new board mode: it supports a maximum of 2 CPUs - hopefully it will get support for more CPUs in the future (as this is still in beta); there's not much you can customize about it, unlike the default Conky Colors mode which has a huge list of options so if you want more info on your desktop, use that instead.